I appreciate the opportunity to review a book by Dr. Adigun Ade Abiodun, whom I hold in extremely high esteem. The first ever live satellite telephone conversation between chiefs of state, was between J. F. Kennedy of the USA and Abubakar Tafawa-Balewa of Nigeria. This is a testimony to the respectable and esteemed past of our Nation. Within the first month of our independence in 1960, Nigeria and the USA signed a MoU on space vehicle tracking. A hypersensitive ground tracking unit was installed at the now University of Ibadan in 1957/ 58, as part of the USA Explorer-1 satellite which contributed discovery of the Van-Allen Radiation belt, It is believed to protect Earth’s atmosphere from destruction by Solar-winds. In 1962, an over 18-kilogram meteorite from Mars landed in Zagami, present-day Katsina State, Nigeria, and it was a significant space encounter for the nation. Today pieces of that stone are scattered in various museums and with private “dealers” around the world. The location of the remains of the core, which is our collective national heritage, your heritage, and my heritage, is uncertain. Morality and natural justice demand that such finds are a public commons and heritage, like the air, rivers, oceans and frequency spectrum, which the state keeps in trust for, and on behalf of, the people. Nigeria’s Space Journey – Understanding its Past, Reshaping its Future is a fascinating yet sobering, 400 page, the record of Nigeria’s historical relationship with modern Science and Technology, as manifested in activities related to outer-space. The book is also an account of the authors’ activities in the “Court” of Obasanjo. This is a better way forward so that we can avoid getting bogged down in blame games instead of, concentrating on learning our lessons and moving forward. In 2001, Nigeria articulated its Space Policy and Programme with the vision “To make Nigeria build indigenous competence in developing, designing and building appropriate hardware and software in space technology as an essential tool for its socio-economic development and enhancement of the quality of life of its people.” However, instead of pursuing the above objective, Nigeria swallowed the bait of the satellite merchants that touted the acquisition of micro-satellites as the quickest and cheapest way to space for the developing countries. With a focus on the upstream-end of the technology, a string of such acquisitions soon became the centerpiece of the nation’s space programme. 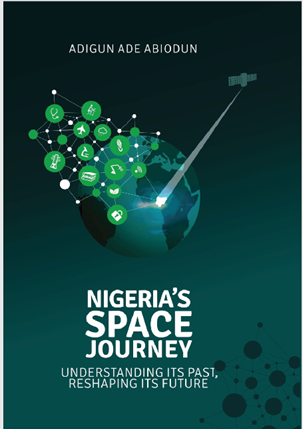 The author examines and analyses the lessons Nigeria has learned on our space journey, to-date. It concludes that the nation’s space efforts have not delivered as promised and that the nation’s space journey should be redefined and redesigned, for Nigeria to attain its space-related goals. As Nigeria looks to the future, it must effectively utilize its natural endowments to earn its place as a respected space capable country. This can be done with an initial focus on the downstream impact of technology. Thus, it would need to retool its own science and technology capabilities and utilize these assets to enhance its economic development and improve the well-being of its people. This section recounts the launch of Sputnik-1, the first human artificial satellite by the Union of Soviet Socialist Republics (USSR) in October 1957, that marked the beginning of the space age; followed by the launch of USA Explorer-1 in January 1958. The Nigerian communication industry in the 1970’s, 80’s and 90’s, was beset with often uniquely indigenous challenges. As we may recollect, the advent of the mobile phone was at that time considered by the nations leading to be only for the elite. It is pleasing to note that Nigerians of all socio-economic capabilities are increasingly leveraging advanced science and technology-based tools since the year 2000. However, as the author observes, we have clearly not weaned ourselves from the mentality of acquiring foreign technology solutions, without commensurate investment in expanding our domestic capacity for foundational intellectual research, as well as basic science and technology. Our ongoing challenges with our various earth observation and communications satellites, highlight that the important lessons have not yet been learned. The author notes that we need to have an understanding of the opportunities that abound in outer space, and how the successful exploration and exploitation of these opportunities is in our national interest. Satellite-based information and services are becoming fully integrated into everything we do, as they help in accomplishing daily human tasks. The author reviewed Satellite capabilities that relate to basic human development that include: Healthcare; Marine Ecosystems and Fisheries; Weather Forecasting; Search and rescue system and Building a culture of peace in Africa among others. Nigeria in the early stages of its space journey focused on technology transfer instead of technology development. We thought we could acquire technology as short-cuts to solve our developmental challenges. With hindsight, it is clear that without a solid foundation, the house will not stand. Unfortunately, building foundations take time and significant efforts. However, our own history has shown us, that there is wisdom in the Parable of the Wise and the Foolish Builders, one who build her house on a rock and the other who built his house on sand. In the main, Nigeria’s Science and Technology sector never truly developed because of we, and decision-makers, in particular, focused on acquiring technology from other nations instead of developing technology locally. Decision makers lost focus on the fact that these things must be for and about people. I recollect the day the author read the already signed contract for NigeriaSat-1. It must be understood that the author, as well as the National Security Adviser at that time, had made significant efforts to obtain, and make inputs into the draft purchase agreement before it was signed. I can attest to the frustrations and obstacles we all faced. I respectfully recollect that upon reading the contract Nigeria had signed, the author shed tears. It was one of three occasions that I witnessed such emotions from the author. We must appreciate that these tears arose from his genuine love for Nigeria; his passion to ensure that in the outer-space sector, in which he stood tall, Nigeria would go in the right direction, thereby resulting in the right outcomes. It was a very sobering time for all of us, and we must continue to endeavor to learn from the frustrations, disappointments and missed opportunities that we witness, to ensure that our nation, and ourselves, do better. We also must appreciate President Obasanjo’s commitment to Nigeria’s space agenda as manifested in February 2000, when he appointed the author as Senior Special Assistant to the President on Space Science and Technology (SSAP-SST). As the author recollects, the “Nigeria Space Program: A Blue Print for Scientific and Technological Development”, was submitted to President Obasanjo on 26 September 2000. I recall the development process and the meetings, of the 24 Space egg-heads, that put the 65-page document together. While not doubting the quality of thought and effort that went into the development, Nigeria’s 1998/ 99 national submissions to the United Nations on UNISPACE III, about our future space activities. I remember the author admonishing us, that, it was 186 pages long, and we had no satellite at that time. Yet, a similar Indian document was only 8 pages long, and, at the time, had about 15 Satellites in orbit. Subsequently, in 2014, India sent a probe into orbit around Mars. Fast forward to 15 February 2017, when India launched 104 satellites into space, atop its own rocket. Certainly, the India space program has come of age. Some may ask whither Nigeria? One of the most important lessons I learned during the development of the aforementioned “Blue Print”, was that a policy or blueprint document should be acted upon. To be acted upon, it must be read. To be read, it must be concise and to the point. Using President Obasanjo, as an example, he had over 40 ministers and 60 special assistants including the author, as well as others, thus totaling well over 150 persons that could send him important memos and documents. Assuming, that each of those persons sent him in a given day, an average of a one-page memo that the President, despite being an avid reader, will need to read at least 150 pages each day. While accepting that President Obasanjo, read more than most, we must appreciate that we must not overload strategic decision makers with unnecessary details. Thus, if a 186-page blueprint is sent to a strategic decision maker, it is clear that most will not read it, and his staff will filter it down to a one or two-page document which may likely leave out the critical issues that can influence the decisions arrived at. I was the person who called him, to inform him that the President wanted him to participate in a crucial meeting and that he needed to return to Nigeria on the next flight. I recollect that the 08 January 2001 meeting was very difficult for all of us. I also recall that the SSAP, and the NSA, had provided a full brief to the President on the issues to be discussed, and I knew the President understood the situation. However, what made my jaw drop was that the President asked the decision makers from the Ministry some questions three times. At a point, he even said, “are you sure.” As you know, when an African-elder asks, three times, it often implies that he knows more than you have told him. The ministries decision makers’ response each time was at variance with my understanding of the issues. I have never forgotten how people, in the ministry, whom I held in high esteem let me down, and by extension let the nation down. As the author explains, for Nigeria to face its future in its space journey, the nation’s science and technology foundation must first be rebuilt. The success of our space journey is tied to the health of its Science and Technology sector. Reawakening Nigeria requires us to see Science and Technology as a tool of Development, taking a cue from Brazil, Saudi Arabia, and South Africa. While, there is a huge difference between Then and Now, however, we know, it should have been better. Build and nurture a private sector that can support the nations space programme. Italy’s 1.4-tonne Bepposax satellite that fell into the Pacific Ocean on 29 April 2003. According to the Bepposax Re-entry Predictions, The Niger Delta was under its path, but for Providence, it could have crashed there. The author poses questions that we must reflect upon as a nation, on our way forward. What exactly are we aiming for? What path do we want to take? A space programme can be one of the most challenging and demanding national undertakings because it requires high levels of intellectual and financial capabilities. However, it can revolutionize the nation’s development trajectory. Our answers to these questions should enable us to redirect our space journey. The Think Tank should conscientiously partner with stakeholders for a united national space effort, on the NSC’s behalf. The NSC should rally the resources that will ensure the sustainability of the nation’s space programme. The NSC should ensure that the nation takes necessary measures to learn vital lessons from the comparable steps of other countries. The importance of this book goes beyond the issues of science and technology to highlight the need for all of us, especially those who have witnessed the unfolding of significant events, to document our thoughts and experiences for posterity. I believe that the perspectives of most of our decision-makers are likely to be lost forever and by extension the memory and legacies of many leaders and players, in the sands of time. This is because, they have not directly documented their roles, perspectives, and thoughts, in relation to epoch-making events. Olusegun Obasanjo is an example of a decision maker who understands this. His perspectives, rightly or wrongly, will likely prevail in history because he has directly articulated them, and not relied on “interpreters.” Likewise, I believe that this book will be part of the authors considerable legacy. Unfortunately, it is possible that the perspectives of other Nigerian heads of government will be quickly washed away because, they have not personally provided coherent insight into what happened, why and their intents, in the context of the time at which they made their decisions. For those who are dead, it is too late, for those who are living, including all of us here today, I implore you to articulate your recollection of the experiences leading up to the many events in our national journey so that we at least have an opportunity to learn from you. We may opt, for many reasons, not to learn, but you have an obligation to provide your insight, should we, or a subsequent generation, choose to do so. Such insights become part of your legacy to us and part of our culture and understanding as a people. Decision-makers must endeavor to take a more strategic view of addressing the science and technology challenges that our nation would face. Researchers and decision-makers often talk “at” each other, and not talk “to” each other. Despite the existence of high-quality indigenous research, many policy decisions arise from advice generated beyond our borders. Both Policymakers and Academia must build communication bridges with the intent of developing synergy. If this means using cartoons, then so be it. The academic community needs to simplify and significantly shorten its communications with decision-makers. I witnessed several of the events that the author discussed as they occurred while he was SSAP-SST. While you have the right to dispute any of the perspectives given, you also have a duty to this nation, posterity, and the truth, to honestly articulate your perspectives, and version of the truth, as you perceive it. Nigeria’s Space Journey – Understanding its Past, Reshaping its Future is a fascinating book that is well worth reading. However, it can be heavy reading for a younger generation that is used to sound bites. It says much of what needs to be said, and it will be an important addition to the repertoire of national development discourse. I encourage, all who are interested in moving Nigeria forward, to read this book. Thank you for your attention. I wish you all well. Nasa’s 85-ton Skylab crashed into Western Australia in 1979.